Ellen Fullman performance at send + receive festival, 2014. Photo: Robert Szkolnicki. Fullman is doing a test-run on the strings in the Gerald D. Hines College of Architecture and Design. Her performances are at 8 p.m., Thursday, April 11 and Saturday, April 13. As a budding artist in St. Paul, Minnesota in the early 1980s, Ellen Fullman did an experiment in her warehouse loft studio. 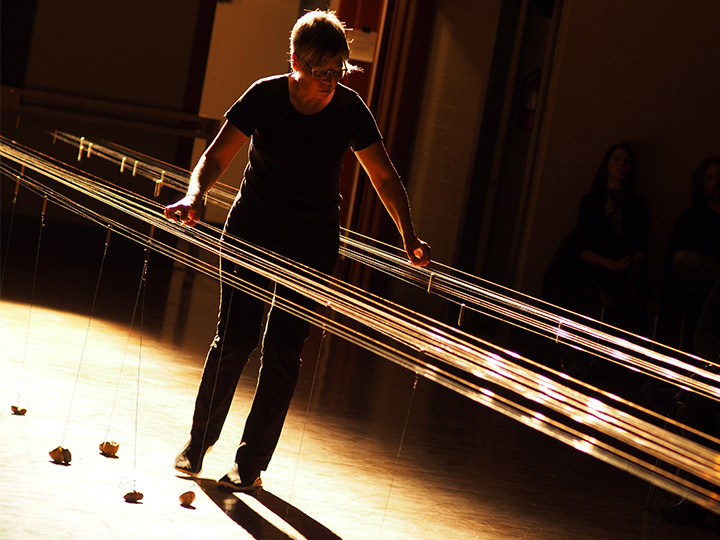 She suspended wire across the space from one end to the other and started manipulating them. Inspired by her love of soul music since she was a child growing up in Memphis and powered by her ability as a sculptor to build, Fullman developed the long-string instrument. More than 30 years later, she continues to fine tune her acoustic skills. Houston audiences will get a chance to see Fullman perform her long-string instrument during CounterCurrent19, a citywide interdisciplinary arts festival presented by the University of Houston Cynthia Woods Mitchell Center for the Arts. CounterCurrent runs Tuesday, April 9 through Sunday, April 14 and features performances and site-specific projects at a range of locations including galleries and outdoor spaces. All events are free and open to the public. For her part, Fullman will literally “play” the atrium of the Gerald D. Hines College of Architecture and Design in two shows beginning at 8 p.m., Thursday, April 11 and Saturday, April 13. 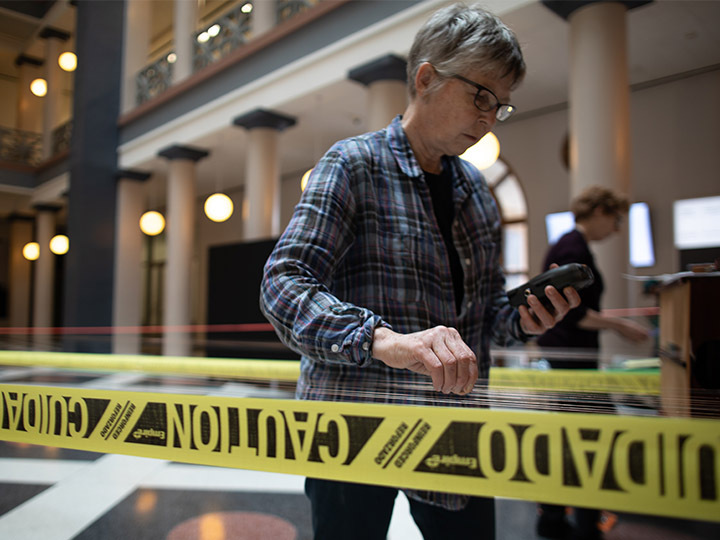 For this particular performance called “The Watch, Reprise, 2016,” Fullman will place the long-string instrument diagonally in the atrium. It will have 40 strings— 20 on each side, that are about 70 feet long mounted on a counterbalanced platform held by weights. The stainless steel and bronze strings terminate into a wooden resonator at one end and tuning blocks at the other. During the entire performance, Fullman will face one direction— never turning her body, and walking back and forth to bow the strings with her fingertips. In order to perfect the longitudinal vibrations, Fullman plays the instrument with rosin-coated fingers and bows it lengthwise. It’s similar to rubbing the edge of a wine glass. “By having direct contact with the wire, I can work with dynamics and changing the overtone spectrum by pressure changes, and I am more sensitive to that with my skin than if I were to wear gloves,” she said. Click here to read more about Fullman’s work as well as the other artists, see the line-up of events and get tickets.